First off, I decided to watch this movie because i've been studying Chinese history, as well as reading a biography of Mao Zedong which really pigued my interest. Seeing how this movie, had Mao Zedong in it, I decided to watch it. And this is what I thought... Story 7/10: This entire movie is basically lifted off of the history books so it doesn't really have a "beginning or an end" since history never does. It starts off from the end of the Qing Dynasty and ends after the initial establishment of the Chinese Communist Party. The reason why I gave this a 7 and not a 10, was because while it was somewhat interesting in some parts it was slow. Acting/Cast 10/10: They were all flawless. I enjoyed all the actors. I only found one thing funny and that was Mao's personality as well as him being portrayed as a innocent guy who wants only the best for his country. I'm not sure if that was really how his personality was or if it was just how they were portraying him. Music 7/10: The music was fine and suited the movie just well. None of the songs were memorable though. Rewatch Value 4/10: I'm not a rewatcher, and this movie isn't a movie I would rewatch. 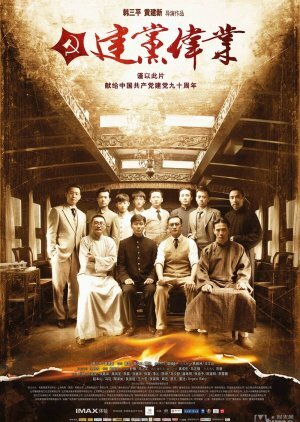 Overall 8/10: This was a good movie that fans of Chinese history would most likely enjoy. Keep in mind, this was made for China, where the Chinese Communist Party is still in power, so nothing negative about the CCP was shown. Regardless though, I enjoyed watching it.